Life is full of opportunities as well as challenges. If your life is far from abundance and wonderful feeling, then you are staying in a house which may have some serious vastu defects. According to the Vastu shastra (a cosmic science of space healing), your surrounding should be productive and harmonious. Negative placements in the space create major vastu defects. Major vastu defects are like toxins in your personal environment. These types of serious vastu defects create imbalance and disharmony in the home. These defects often bring many obstacles and uncertainties in life. Furthermore, some of the defects create a serious block on your wealth luck according to Vastu shastra. 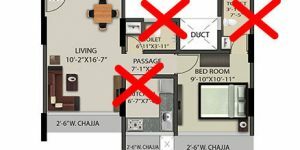 If you are looking for a new home, you should avoid a house with the vastu defects falling under “Major Vastu defects” category. Effects:– Quarrels, Misfortune and, almost serious bad luck. Effects:- Financial losses. A person will be staring at a mountain of debt in spite of your higher income. A pole in front of the main door. An electric pole, telephone pole or also a tree opposite the main door are the obstructions. Effects:- As a result, it creates obstacles in all important work of the inhabitants. Effects:- Bad impact on an Upcoming generation, chronic health problem and, physical deformity. It required strong vastu remedies. Effects:- Unwanted expenses, Litigation, Health issue and, also Financial losses. A person will experience mental as well as physical fatigue. Any major vastu defects required immediate attention to avoid the major calamities. As a result vastu defect left unattended creates a serious problem in the personal as well as professional life. Many defects can be easily modified or corrected by using vastu remedies under the guidance of an expert vastu consultant.